Being a good crew member on an airline requires the patience of a saint. They’re expected to handle everything from unruly passengers to screaming children and turbulence with grace. 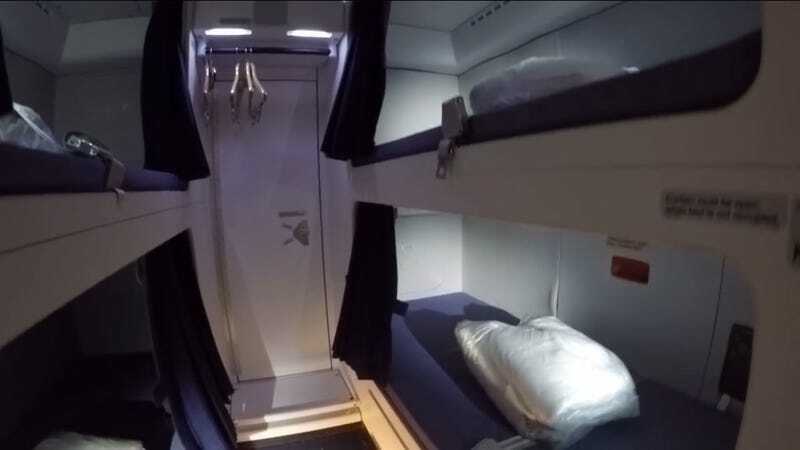 Fortunately, there’s a place they can hide out on the Airbus A380 if they can’t handle it anymore: the hidden crew rest compartment. It’s worth noting that different airlines outfit their planes differently, so perhaps this compartment looks different on a non-Lufthansa plane. This video comes from one of Lufthansa’s A380s, and shows a compartment that’s off-limits to the general public: the lower deck crew rest. Perhaps the most impressive part of this secret compartment is how quiet it is, especially in the bunks furthest from the door. It’s the ultimate luxury on a plane: silence. Even the nicest first class seats still sometimes hear the grating echoes of someone else’s unruly screaming offspring. Inside, it looks a bit like a really no-nonsense Japanese capsule hotel. There’s simple, utilitarian bunks and a shared bathroom. That’s all fine. If you can’t broker peace between a couple of passengers who just can’t get along, the silence alone down here would make it the ultimate place to regain your composure.